When Google announced Wave, my impression was that it was a glorified messaging protocol. Based on their preview videos, it appeared that Wave would allow you to hook into various services, such as YouTube and Flickr, pulling in content to share in a conversation. The live updating and thread branching features looked interesting, but I left without being firmly impressed. On yesterday’s Marketing Over Coffee, Chris Penn said he’d been able to look into the developer docs for Wave. What he discovered was that Wave was more than just IM on roids – it’s a federated protocol, apparently using XMPP, that allows for synchronous real-time streaming of information between multiple platforms. If this is true, then Wave is potentially a game changer, allowing information to not just flow into a conversation, but back out of it to update outside sources; bi-directional exchange. Bi-directional interfacing of services will allow us to break down the silos that keep media channels independent. Twitter, Today: I post an update and followers A & B see it. If follower A replies, I can see it. If follower B is not following follower A, though, follower B can’t see follower A’s reply to my initial update. Facebook, Today: I post an update and my friends can see it. If anyone replies to that update, all my friends can see it, regardless of whether they are all friends with each other. Twitter + Facebook, Today: I can dump my Twitter stream into my Facebook account. This means that my Twitter followers and my Facebook friends can both see my updates. Unfortunately, at this point the conversation fragments. When my Twitter followers reply, my Facebook friends don’t see that side of the conversation. This is true of replies on Facebook as well – they don’t push out to Twitter. 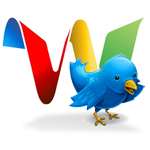 Google Wave and Microblogging: With Wave, if I’m understanding it properly, you can post to Twitter, populate your status updates on Facebook, and any replies from any sources can be seen by all participants in the conversation. It won’t matter where people enter a conversation from, they will all be able to exchange information with each other. Twitter and Facebook, Plurk and Seesmic, it won’t matter which account your using – as long as you’re added to a wave, you’ll be able to participate with individuals on different platforms, using different services. UPDATE: I was totally wrong about what Wave is. So what. I want my version! This entry was posted on Friday, June 12th, 2009 at 10:17 and is filed under Featured, social media. You can follow any responses to this entry through the RSS 2.0 feed. You can leave a response, or trackback from your own site.